A significant market of solid biofuels for heating applications in the residential sector exists in most of the Mediterranean countries. In addition to wood pellets and chips a number of solid biofuels derived from typical Mediterranean biomasses are utilised. Within the framework of the H2020 Biomasud Plus project “Developing the sustainable market of residential Mediterranean solid biofuels,” a study about solid biofuels marketed in seven countries of southern Europe (Croatia, Greece, Italy, Portugal, Slovenia, Spain and Turkey) has been carried out. This study shows that olive stones are the most important Mediterranean biofuel in the residential sector. Moreover, agricultural pruning from olive trees and vineyards are reported as biomasses with high potential for solid biofuels production in that sector. Taking into account their widespread production in the Mediterranean area and the actual and potential markets as fuels in residential sector, three biofuels were selected to be tested in different combustion small appliances in order to provide recommendations for manufacturers, installers and end users. 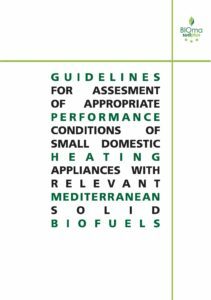 Considering the results obtained in this study, the document “Guidelines for assessment of appropriate performance conditions of small domestic heating appliances with relevant Mediterranean solid biofuels has been published. These guidelines show a review of European standards and legislation on solid biofuels and domestic combustion appliances. The results obtained in a market study about domestic heating systems in southern Europe are also shown. Three biofuels (olive stones, olive tree pruning pellets and vineyard pruning pellets) and six combustion appliances (three stoves and three boilers) were selected to perform combustion tests in three different laboratories (BIOS in Austria, CERTH in Greece and CIEMAT in Spain) following common testing procedures. Taking into account the obtained results, recommendations have been provided to use the selected Mediterranean biofuels. Some combustion appliances present in the market can use olive stones without fuel feeding or operating problems, with the possibility of fulfilling the emission limits established by the Eco-design Directive through the Commission Regulations (EU) 2015/1185 and (EU) 2015/1189. To avoid problems related to the fuel quality, the acquisition of biofuels with quality label (i.e. Biomasud quality label) is especially important. Moreover, users should obtain the guarantee (from manufacturer and/or installer) that the appliances they are acquiring can use olive stones as fuel. Considering the behaviour of the olive tree pruning and vineyard pruning pellets during the combustion tests, it must be concluded that they are not appropriate fuels for the stoves and small boilers used in the project, mainly due to their high ash and nitrogen contents. Even so, guidelines provide some recommendations for biofuels production and manufacturing and operation of heating appliances in order to use these biofuels with emissions fulfilling the Eco-design Directive.